About Veilhofstraße in Wöhrd, Nürnberg. An open letter to my immediate family. But to those of you who I do not yet know, but who my be able to contribute to this discussion, I invite you to contact me using the link at the end. Wenn jemand helfen kann hinzufügen, um diese Diskussion, kontaktieren Sie mich bitte über den Link am Ende. One of the first things I did after I began to search after my family roots was to try to find something about where my father was born. I remembered a story of my mother's about when she and my father returned to Nürnberg to live for a few years after his retirement. She was able to find a copy of his birth certificate, much to the surprise of my father who had apparently assumed that all his old records were lost forever. As he never had American naturalization papers of his own, it was a tangible connection to his past. 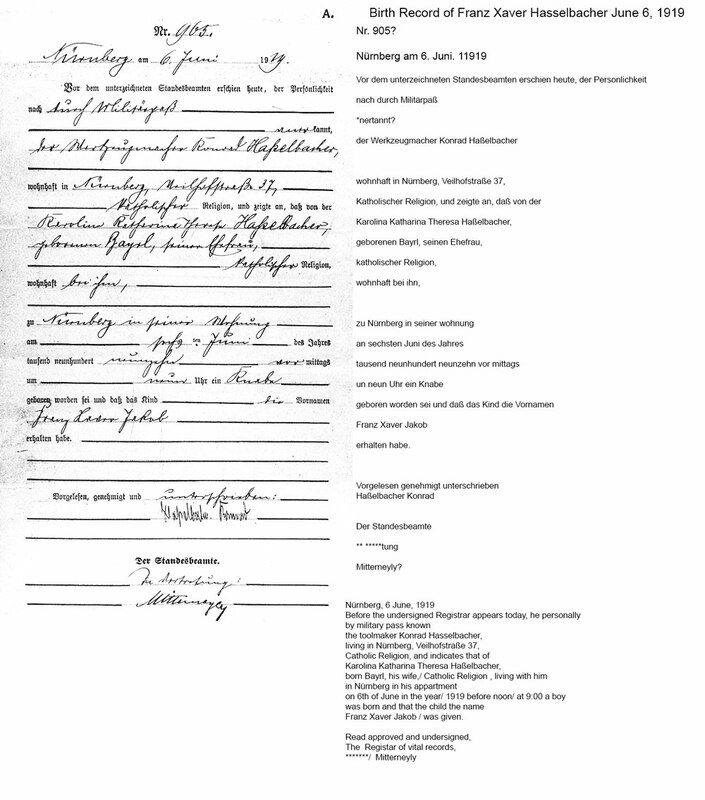 This civil record was the first old German one I encountered. 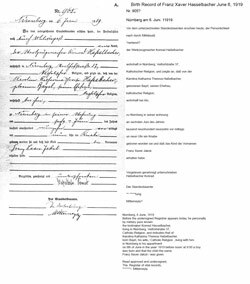 When I was finally able to translate that birth record, that I learned my father had been born at 37 Veilhofstrasse, in Wöhrd, a suburb of Nürnberg. I am eternally grateful to Frau Elvire Matheis of the Standesamt Nürnberg (vital records office) who opened the doors of my German heritage for me by later opening the books for me to many other old records of my Hasselbacher and Baÿerl families. At that time, the old German writing in the record was as so much hieroglyphics, but I could not help but to be awed in the presence of the original handwritten books containing the actual signatures of my grandfather and other relatives long-gone. In my quest for meanings and things to hold on too, I wanted to learn what the name of that street might signify. In December of 2010, I posed a question in German to the user forum of Leo, a prominent on-line German dictionary: "What might Veihofstraße mean?" A few initial replies largely were focused on correcting my German grammar! In any event, I was not equipped linguistically to deal with any of them. After three years of German, and renewed confidence, I recently returned to the thread I launched and re-read the 21 responses that had been submitted. What a treat! I was impressed that a few folks had even done some research on my behalf– another example of the kindness of strangers. "Was bedeutet "Veilhofstrasse"? Mein Vater war an Veilhofstrasse in Nürnberg geboren. Hat 'Veilhof-' einen Sinn? Danke.," or in English, "My father was born on Veilhofstrasse in Nürnberg. Does Veilhof have a meaning?" I was quickly told that my grammar was incorrect. I might properly have asked, "Mein Vater wurde in der Veilhofstrasse in Nürnberg geboren," Despite the fact that another came to my defense noting that the famous German writers Goethe and Schiller had used my language, I freely admit my German was (and still is) schlecht. Strasse or Straße is obviously a street. A Hof is a yard or courtyard, often part of a farm. There is no modern German word "Veil," but its diminutive Veilchen is the word for the flower, violet, or a black-eye. The German word for the color violet is Violett. I learned over the last few years that the origins of many of these old house, farm, and street names have been lost in the mists of time. A flower, or a tool? Indeed, the first speculation offered was that Veil might refer to the flower. 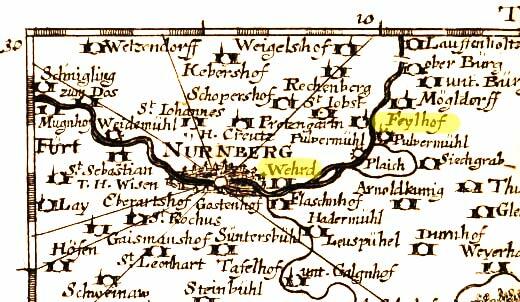 However, another contributor gave a link to an old 1692 map of the Nürnberg area in which the name is spelled "Feylhof." The root of that word likely refers to the iron tool, "file." The modern German word for file is die Feile, pronounced just as it is in English, or for that matter, as Feylhof would be pronounced. Recall that another of our family names is Baÿerl– with its alternate spellings of Bayerl or Baÿrl. All of these are pronounced as rhyming with the English "bile" or "file." I learned from my research on the Baÿerls that in old German, the letters 'i', 'y', 'ÿ', and 'ii' seemed often to be substituted. It was emphasized how the spelling of various places and words has changed over the centuries and varies by dialect and location. This was not a surprise to me. Following enforcement of new administrative methods and map-making by Napoleon after his annexation of Bavaria, many spellings were additionally fixed in place that may or not have been original or accurate. The original Veilhof (Ober- and Unter-, or upper and lower) left traces on twentieth century maps of Nürnberg and Wöhrd. The Feilhof on the Pegnitz, was formerly a Saigerhütte, or smelter. It was operated from about 1460 and extracted silver from copper ores. In 1469, the property came to the famous Tucher (as in the beer) family. The authorities of Nürnberg closed it because the extensive amount of wood required to run a forge or smelter was depleting the local forests! Thus we have an early reference a metal-working activities at the Veilhof. An extensive history names many of the owners up through the present time. Speculation was offered that the Veilhof was named after its first inhabitants or owners earlier than the time of the families named above. Sometime in the mid 1600s, a noteworthy manor house was built. We have an image of it from 1630 with an associated mill on the Pegnitz River that is unlikely to be the mill-works at Unterveilhof. I ran a more detailed history through Google Translate so you can get the gist of it. This was a divided property with the manor house at Oberveileilhof and, by at the time of the destructive Second Margrave War in 1552, a Pulvermuhle, or powder mill at the Unterveilhof upstream on the Pegnitz River. These kinds of mills pulverized materials into powders, including gunpowder! Perhaps that is why they tended to blow up! There were land disputes that I cannot follow, but around 1813-18, the Veilhof was annexed into the community of Rennweg. There were apparently some 7 primary and eight outbuildings with 60 inhabitants. In 1899 the land was annexed into Nürnberg. One commenter extracted an item from an 1800 historical account. In a list of members of trade associations or guilds from 1423, was a man named Cuntz Feylsmid whose symbol was a hammer and anvil. There are many German family names related to the root word "Feyl": Feyler, Feil, Feeiler, Feilenhauer, or Feilenschmied (file-smith). We may reasonably speculate that the original name goven to Veilhof was related to the work done there, and additionally that there were people who may have taken their family names from the place, much as we took our name Hasselbacher from the Haselbacherhof in Gresten , Austria. I enjoy the coincidence that my father Frank was born, and his father Konrad and uncle Michael (who were a toolmakers) lived on a street named Veilhof. Ironically, parts of Wöhrd continued to house industrial activities which made it a target during the Allied bombing of WWII. I fantasize that the trajectory of my own career as a scientist owes something of a formative essence to the Veilhof. I also relish the coincidence (is there such a thing) that my Great-Great Grandfather Abraham Wilhelm Ecker, who was born in Unterreichenbach, Württemberg, came to America in 1850, and fought in the Civil War– was a file-maker. As I worked through all of this, I continue to be impressed with how much information is out there if one wants to look for it. I was reassured and grateful that my investment in trying to learn a new language so late in life payed off. Even with the wonderful help of these and other strangers, I would not have been able to appreciate what was being offered. I am humbled and in awe. From what source comes the unexpected sense of pleasure of having learned a few obscure things? Is it the satisfaction of having solved a puzzle? Probably in part this is the case. However, it is more than that. I am gifted with a great sense of time and place; a shared connection with those whom I have loved and others to whom I am indebted for their labors as well as their genes. I join with people who are otherwise lost to me. It gives me a common bond with relatives and new friends who still share that space and experiences. I cannot deny that my search for information, if not wisdom, also allow me to play with computers and cameras, to travel, to write, and to meet wonderful new friends and family. I recommend the effort to you with with the warning that searching and sharing can be habit-forming! Extensive history of the Veilhof from the German website, "Burgen und Herrensitze in der Nürnberger Landschaft. A Google translation of the text from above. (Temporarily stored at the bottom of this page. Another history from Franken Wiki. Larger scale map of Nürnberg area in 1692. Link to the 1692 Atlas of Franconian Maps in Google Books. Very nice map from 1929. My first attempt in 2010 to learn the meaning of Veilhof. Overlay of old and new maps of Wöhrd showing location of the Veilhof estates. A search for a Bridge over the Pegnitz where a photograph of my future Grandparents Hasselbacher was taken around 1916. There are many links to maps, etc. Here are some photos, and a video of a field trip to the area of the Unterveilhof. Located between the garden and the Bretz Pegnitz Veilhof arrived in the middle of the 15th Century by Wilhelm Rummel at Herdegen Tucher, who operated there since about 1460 one Saigerhütte for extracting silver from copper ores. Because of the enormous consumption of wood they had to like all the other set in the Nuremberg area of ​​their operation 1469th Herd gene granddaughter Helena Tucher brought Veilhof through her marriage in 1513 to her husband, Christopher Kress. Already in 1517, he appears, however, in other hands, because this year had to Anton Rosenthaler undertake to provide the Veilhof in case of war to the Nuremberg City Council are available and in the meantime here is one seat was created with a certain military value. In contrast, was mentioned in the report to explore the landscape, the Council had before the outbreak of the Landshut War of Succession in 1504 in order given, nor nothing like that. 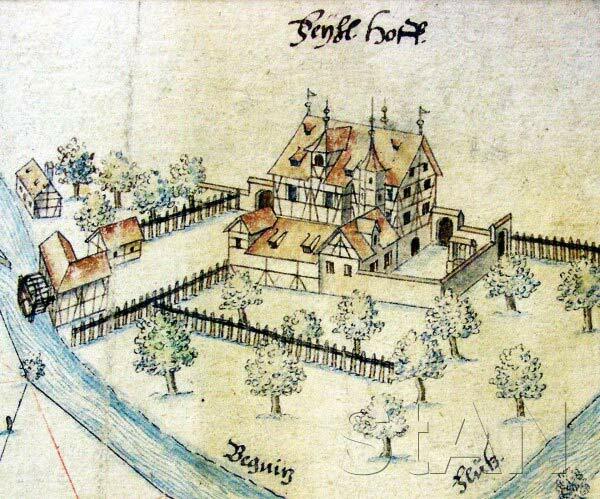 After the destruction of the "burgerssytzles" and the slightly downhill Pegnitz situated, 1507 Powder Mill built in the Second Margrave War on 18 May 1552 was probably soon built a new building, which is shown at the Nuremberg round brochure from 1577/81. As the owner of the (upper) Veilhofs again until Sigmund Herel is known, who married in 1614 Dorothea Rosina Kress and 1618 died. His widow brought the Veilhof 1621 to her second husband, William Imhoff. 1630 produced the famous "engineer" and artist Hans Bien a detailed view of the two-storey timber-framed building, including stair tower at the southeast corner and southern extensions. This status is supplied by an engraving in Meisner's "treasure chest" of 1631/78, which also shows the somewhat further east farm Unterveilhof. After the death of Dorothea Rosina Imhoff in 1632 became the seat for his son William Imhoff (1622-1690), first by two guardians, the Nuremberg Council consultant Dr. Tobias Oelhafen and Hanns Wilhelm Kress von Kressenstein, administered and managed, the outbuildings 1634/35 one could renew. The manor house, which is in the neighborhood of Henzschen powder mill (not to be confused with the one in Woehrd) was dropped, according to his son William's death, (d. 1732) the forest magistrate Lazarus Imhoff. His widow had to see how the house next door burned down in 1739. An engraving by Johann Ulrich Kraus after a drawing by Johann Andreas Graff shows Oberveilhof 1688 of the west side as a representative two storey pitched roof building, which obviously plastered facades are presented. A pen and ink drawing about 1698 on the other hand provides the view of the south and east, and the stair tower still with view pocket movement to recognize the subsequently placed corner bay considerably. In the late 18th Century the Oberveilhof was owned by the Jacob Christoph Joachim Imhoff (1754-1820), however, made the 1802 bankruptcy. By jurisdictional disputes between the authorities of the imperial city and the Kingdom of Prussia, which had once occupied the Nuremberg and surroundings to the city gates, the Gutskomplex top and Unterveilhof reached including the former powder mill in 1805, the brothers Dr. Martin Wilhelm and Johann Philipp von Neu. The latter took over the mansion and lived there since 1810, and sold, but in 1839 the entire Gutskomplex again. Probably the mansion existed at that time was no longer, as it implies that a unspecified dated Brandun-luck in the early 19th Century should be set. The former head of the Zeltner's ultramarine factory Thomas Leykauf founded with a partner on the ground Veilhof-1841 a factory for Turkish red, which ceased in 1854, but its operations. 1863 acquired founded in 1824 by Karl von Raumer private boarding school for poor and neglected children, which was housed since 1849 in the so-called Gürschingschen garden, the mansion and set up in a former factory building the "rescue house Veilhof" field. After this building was too small and not the hygiene equivalent, it was demolished and replaced in 1902 by a new building that was after laying the reformatory to Hilpoltstein 1922 acquired from the Evangelical-Lutheran Church and used for their seminary. Badly damaged in World War II, it was restored in 1948 / modified 52nd On the associated area is also the country since 1955 Ecclesiastical Archives housed.